Just bought a Lumix GH1 for professional production. Anyone else doing this too? No stranger to using 'consumer' cameras for commercial production (used HV20 uncompressed for promotional video in 2007 - 'Your Future Is Business' HD 35mm SDI 4:2:2 on Vimeo ). Other than the fact the GH1 looks consumer (which doesn't help for client confidence) and the audio limitations (can't monitor, no levels, poor pre-amp) and the lower-end codec, I believe that the GH1 will serve well. Would love to hear what everyone thinks about this. Amazing and nice work. I will be purchasing Canon and the gh1 as my backup..
Thomas, which Canon video camera have you purchased as your main camera? What kind of work with it are you intending on doing? Cheers! I used the built-in audio system to record from the wireless lav mic too! Little audio control, but it worked for the project. The piece, when shown, won the 'people's choice award' at the venue; everyone marvelled at how clear/crisp and beautiful the image appeared! I was absolutely impressed with the camera on production day - aside from little audio control, the image control was fantastic and I didn't need anything more. The histogram and focus-enchancement option were more than enough, especially with all the options to toggle shutter and ISO. And it was fun to shoot with! Thanks for that. Great video and very useful to see someone shooting stuff not too dissimilar to (some of) what I'm doing commercially with my PMW-EX3. My business is doing well and I'm now looking hard at the idea of getting a Lumix GH1 to supplement my Sony EX3 for those kinds of shots that are hard/impossible to get without expensive (and big!) adapters and also to provide me with a good second Cam in certain corporate video interview etc. situations....so it's good to see at least one person using this little cam commercially! I like the idea of buying a second HD video capable camera....seems a much better way of spending some money than on a Fujinon 0.8X wide angle and Letus for the EX3...and potentially much cheaper! 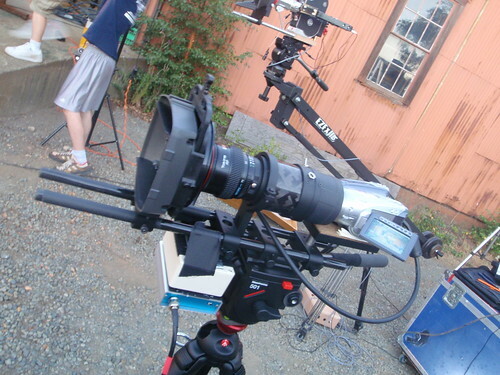 Something like a GH1 or Canon 7D and some extras will open up more flexibility and creative options for my video work and give me good stills capability as well, and probably for a lower cost. Means I would get to use my Rode Videomic and Stereo Videomics again! (with a 3.5 to 2.5mm adapter lead to enable plugging into the GH1 I believe - pity about lack of audio monitoring though). I've read a ton of reviews the last few days on here and all over the web and the GH1 is looking a very strong contender. About the only thing I'm still a little concerned about is the relatively low bit rate AVCHD format - I'm editing on Macs (mostly) so it'll need transcoding to ProRes etc. I've been spoilt...and so have my commercial clients... by the superb XDCAM EX Codec but having been initiated on HDV a few years ago I'm carefull about how I shoot anything with high motion detail anyway so I guess I'd just treat an AVCHD format cam as I do my little Sony HC1 - thinking all the time about what I'm pointing it at and how. Obviously, I'd use the EX3 for the bulk of the material capture anyway. Most of my clients want a Std Def DVDs and some also want 720p HD (usually WMV or Quicktime) so I think it'll be fine as I believe the 720p mode (50p) on the GH1 is OK/relatively smooth... from what I've read and seen (as best one can on Vimeo et al). I'm also looking hard at Canon 7D as the other alternative Video DSLR choice....but currently leaning heavily towards the GH1. By the way, I think I'll probably pass on the 5D MkII for cost and, more importantly, lack of 25p to match my (PAL) EX3 ...and the current lack of flexibility/manual control which would frustrate me having been so "spoilt" by the EX3...I know a firmware update is coming next year for the 5D Mk II (but that's too far out for my needs). The 7D is a much nearer comparison/competitor for sure and as my reading around has found, many have not found it an easy clear cut decision. It really depends on ones own specific needs. Of the current crop of VDSLRs the GH1 seems to offer the best flexibility, ergonomics and intelligent design for MY needs (albeit it still has a few little niggles... as does any cam)...but I've yet to make my final choice. Q1: Your thread is probably the best place for me to ask if anyone is mixing a GH1 with EX1/EX3 in commercial work. Anyone? Q2: Corporate clients usually look suitably impressed when I get my EX3 rig etc. out. I'd imagine they might look equally happy if I got a Canon 7D out instead or as well....maybe the odd raised eyebrow and a question like "but I thought we were doing a video, not stills? "...but how do they react to your little Lumix GH1???? Do you get the "you're going to shoot video on THAT?...it's so small!" type questions or "what make is that?" type stuff? Please don't missunderstand - I've never been a brand snob and will use the best tools for the job I'm doing (that my budget allows) and for me designed in flexibilty and, near enough, full manual control is really key, even above price - which is why the GH1 is on my short list and the Canon 5D Mk II is not. The GH1 is after all a Panasonic and they make good kit - full blown video cameras included - but "Joe Public" probably won't know that! I'll continue to agonise on which direction I'll take but in the meantime I'm just being curious and would love to hear real world experiences from others using this little cam for video in the business/corporate/commercial environment. Thanks for reading such a long post! I’ve only ever shot in the 60P mode with the GH1 – I’ve read that it holds up better codec-wise, which is a potential bonus. The main reason I shoot at 720P 60P is the option to slow it all down later.. too cool to pass up. Also, the 4:2:0 isn’t apparent at all. The three years prior to the GH1 I was shooting 1080P 24P at 4:2:0 (and editing ProRes) and it was a pain to re-encode everything with a blur-then-sharpen of the chroma to get rid of the colour-jaggies. Not a problem at 720P with the GH1! I’ve had little problems with the GH1’s codec – I do always take more than one take of B-Roll shots, as a safety for that reason, amoung others (force of habit). I’ve noticed the occasional hic-up with the codec, but again, I have more than one take and I’ve always had options. I wouldn’t ever suggest using a D-SLR as an live-event recorder – I’d stick to a proper ENG camera for that. I’ve never had the camera overheat/crash as I’ve read has happened to Canon 5D MkII owners, but then again, I’ve never rolled for more than 35 minutes and 44 seconds (which is handled fine). The video controls on the GH1 are great for what is primarily an 'SLR' – it’s well thought out as far as a camera that does video is.. ! It’s not an ENG, but it does a lot (far far more than the 5D offered when it was introduced). The few things for the wishlist: zebra, audio level’s shown, and HDMI/video out. But I’m coping very well without. If I had a collection of Canon prime lenses, and didn’t own the GH1, I’d go for the 7D. But I’m a Nikon guy, and the GH1 was the best option value-wise – and I’ll continue to use it till I see a Nikon unit that bests the GH1’s value and does video. This is only the START.. I imagine we’ll be seeing Scarlet-killers this year, and so it’s going to be a wild ride. I have a matte box, French-flag, carbon fibre rails, and a mic mounted on the camera so it’s hidden and certainly doesn’t look like it’s just your average D-SLR, but there have been comments on it’s size ;) I wish I had more doo-dads to build it up to main that ‘pro’ look that clients really do need to feel to trust you. So far it’s so new that no issue has come of it, but we’ll see. I’d say, buy for value now, not the long term. With the GH1 I can buy any adaptor for any major lens maker, which is awesome. With the 7D you’re going to have to go Canon. Who knows .. the next Nikon might offer something that’ll make it a 5D killer ;) Either way, it’s going to be a fun ride. I match GH1 with primes very nicely with EX1 and Letus. An interesting compromise (or is it deception?) is to show off a "real" camera --whether it's working or not--to the client as proof of your gear cred, and the shoot on the GH1 without them knowing. You can also turn it into a plus--in my case, I had to get a Japanese version since there USA ones were so scarce.Talk it up as the next big thing. You're ahead of the curve. Finally, don't make your gear's impression solely dependent on your camera. Good lights, grip, audio, and TIGHT CREW make a much bigger impression (in my experience) on client than camera. Whenever I brought out the GH1, with a Mattebox and Rails it was still obvious it was small – especially when swapping lenses. That said, usually my assistant or I would explain how the technology in this camera three years ago would only be available in an $80,000+ video camera. They understand this, because everyone is aware how quickly technology is advancing. I am not into deceiving subjects in videos and even after informing people that I was doing a shoot for such and such, sometimes, especially when shooting in areas where I was not welcome by the majority of the people (despite having clearance) the little camera was a benefit. Many/most people didn’t realize it was shooting video (or sound). In fact, people would often not clue in that it was a video camera – I’d be getting my shot, but because I wasn’t looking through the eye piece, they figured I was just setting up the shot, or working with some dials. Once they saw me pack up, they realized that it must have been doing video since I never pushed the shutter; yet, I had ‘gotten my shot’. Yes, everyone believes bigger is better. There’s a reason that ENG shoulder cameras don’t shrink – perceived quality. I have no problem saying my camera is better than the local television station’s SD Sony cameras with SDI out – even if average Joe doesn’t really believe me. I always have my widescreen iPod Nano with my work on it with me; so, the work can figuratively speak for itself anytime. Professionals may be able to use GH1’s and 7D’s for a little while, but when average Joe’s daughter buys a Canon Rebel that does 60P, they’ll expect you to be shooting with something that’s perceived to be better by it’s physical dimensions. The gig will be up – if it isn’t already. The upcoming scarlet will cater to this need for sure – I am hoping/expecting Canon and Sony will over cameras that have bodies similar to a smaller EX1 with chips the size of Micro 4/3rds or so and interchangeable lenses. Then I can use an adapter and my Nikon adapter mount and keep on shooting. Technically shot exactly the same as the Dockside documentary - GH1 + the same wireless lav mics. All 720P 60P in a 24P edit. 50mm F1.4 Nikkor for interviews, all B-Roll is shot with stock kit lens. Cheers! Nice work guys, just one comment! Don't be shy of the 1080p mode! It has it's limitations, but especially for interview shots and such I'd be using it over the 720! I'd say shoot in 720 60p and export to 720 60p. i'm thinking about getting the GH1 for these kind of jobs as well as my creative work and doodles. here in spain most clients seem happy with SD, purely due to price. i'd like to up my image quality without breaking the bank and the GH1 looks the best option due to it's cost. is your work only for internet distribution? the camera seems fine for that. what about dvds? how does it perform when watching on a bigger screen? Most/all of my work has been delivered as finals in SD. I shoot HD for many reasons a) longevity/future demo reels b) sharper final image c) bragging rights d) because it's 'better'. But no client has ever requested an HD video final, thought down the road I hope they will because.. it's so darn nice. 720P is faster to render/edit than 1080P, so that's something new I've discovered (I've been doing 1080P 24P for the past 3 years). I'm sure SD is blazing fast on the same hardware, but 720P feels fine on a 4-year old Mac Pro. The GH1 looks great on a large screen - the Our Place 'Hope & Beloning' video was premiered on a large screen at a gala event - 12feet across I think. Looked great. Looks great on DVDs too. It looks like it should - no surprises for me so far. Have fun - Cheers! The Gh1 has everyting I need. I have some Nikon lenses and a few Canon's. I want to be able to use both.The only thing that holds me from getting the Panasonic GH1 is the 24 f/s as opposed to the 25 f/s on the Canon 7D. I want to mix the footage with that of 1080i 25 f/s that I was shooting with a Canon HV20. Or has there been an update to 25 f/s on the GH1? Or is there such an update to be expected ever?